I sculpted this seasonal fellow from paper clay. Due to lack of snow, he is covered with glittery artificial snow. Ho ho, ho! 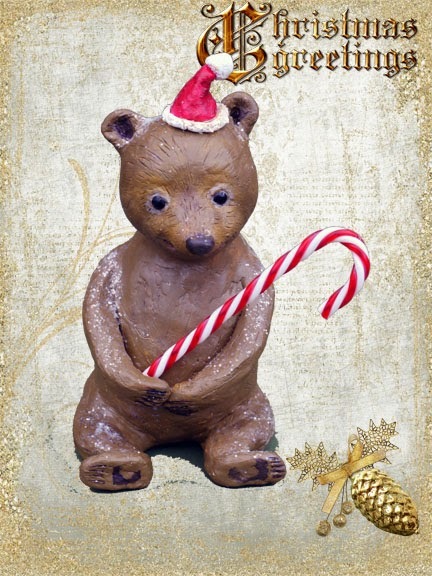 I'd like to thank the lovely collectors who adopted bears at the Christmas Treasures online show! It is always lovely to know they have gone to loving homes. I haven't posted in a while. Unfortunately, my health has not been good this year and this has impacted on my bear making. In fact, I have had to withdraw from the Great Brighton Teddy Bear Event this weekend. Apologies to collectors who were hoping to see me there. I have been finding it more and more difficult to work on large realistic bears, especially their armatures, and so in future I will only be creating smaller teddies without armatures. It is difficult to explain the amount of strength needed to create large bears. I do have three large, realistic bears that I will offer for adoption over the next few months, but they are likely to be the last. For the forseeable future, I will be developing my smaller whimsical designs. This is a very difficult decision for me as I adore realistic style bears, but I need to put my health first. I hope to launch my new Whimsical Teddies designs at Hugglets in February.